Originally published as “From Primitives To Zen”, Eliade presented an anthology of sacred texts for his students. The instigation for this anthology of religious texts came during my first years of teaching History of Religions at the University of Chicago. In discussing a specific problem, I expected my students to read at least some of the basic original sources; but I soon discovered that I was unable to recommend to them any single work where one might find a number of essential texts regarding, for example, high gods, cosmogonic myths, conceptions of death and the afterlife, etc. So he made one himself! Eliade goes from Amerindians to the monotheistic religions, far Eastern, small tribes from around the world and all put in different chapters which deal with certain topics (creation of man, origin and destiny of the soul, patterns of initiation, etc. etc.) Eliade recommends reading this book from cover to cover which makes well over 600 pages to cover. The book is actually a compilation. 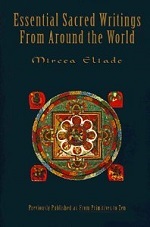 Eliade collected translations from various scholars (some texts are his own). Not all texts are translations of traditional texts, quite a few are descriptions of some scholar about (for example) the view of some Indian tribe on a certain subject. There are highly interesting, but also fairly dull texts and the same goes for the different subjects, but I understand why Eliade recommended to read the book from cover to cover, since you get different religions on different subjects which gives of course some more insight. A very nice book, but not a very easy read.